Unless you’ve been hiding on a remote island, you are more than aware that the holiday shopping season has officially begun. Forget the fact that most stores had Christmas decorations on the shelves before Halloween was over. Now it’s official – Black Friday, Cyber Monday – whatever they want to label all of it – the frenzy is here. I always thought it should be a fun experience. The truth is, it doesn’t bring out the best in everybody. Go figure. Here’s my take on things. 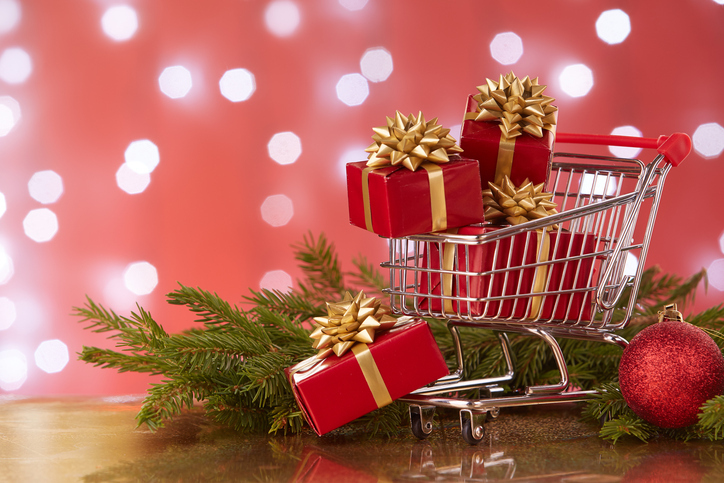 Before you head out to experience the wonders of holiday shopping – be prepared. It’s safer that way. Be prepared to stand in long lines, with agitated people who are holding armfuls of stuff and invading your personal space to the point where you can feel their breath on the back of your neck. For some reason, the closer they get to you makes them feel farther ahead in the line. Be prepared for the person in front of you to have a return – without a receipt – for something they bought months ago but now need that money for the holidays. Be prepared to get cut off numerous times in the parking lot by drivers trying to beat you to the nearest parking space. It’s not worth an accident or a confrontation. Be prepared for the noise – the yelling, the crying, the screaming, the never-ending din of the crowd and of course, the Christmas music. Be prepared for items to be out of stock, coupons to be invalid, and that person who pushes you aside to grab the last one of something off the shelf. Be prepared for snarky people, stressed out store personnel and don’t expect any of it to make sense. Notice I said, “Be prepared.” Will you experience all the things mentioned above? Probably – hopefully – not. But, if you prepare for it, it’s easier to handle, there are no surprises and you won’t take it personally. Ho-ho-ho. It comes around once a year. Have fun with it and enjoy it. Thursday, we celebrate Thanksgiving 2017 and the celebration for everyone will be a little different. Some look forward to family gatherings and the chance to spend time with loved ones and friends; some anticipate the holiday feast; some count the hours until the Black Friday shopping frenzy; others are “getting ready for some football.” No matter how we celebrate the one thing that’s universal about this day is that it is a time to give thanks; be grateful for what we have and for the people in our lives. We all know that, right? So, as a little bit of a twist in direction, here's some things you may not know about the day. 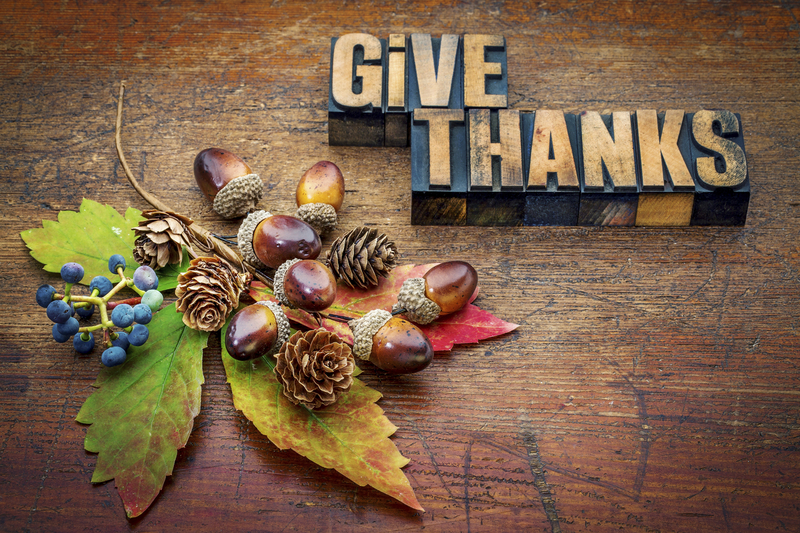 Did you know that the year of the first Thanksgiving celebration was 1621, but it wasn’t until 1863 when Abraham Lincoln proclaimed the day a national holiday? Or how about that Thanksgiving ranks second among America’s favorite holidays? How about this? The average number of calories consumed on Thanksgiving is a whopping 4,500 and the Butterball Turkey hotline answers more than 100 thousand questions each November and December. In 2016, 154 million people shopped over the Thanksgiving weekend. The average person’s spending was $289+. Since 1966, the Detroit Lions and the Dallas Cowboys have played each other on Thanksgiving. The Macy’s Parade became a Thanksgiving fixture for the first time in 1924. More than three million attend the parade each year. 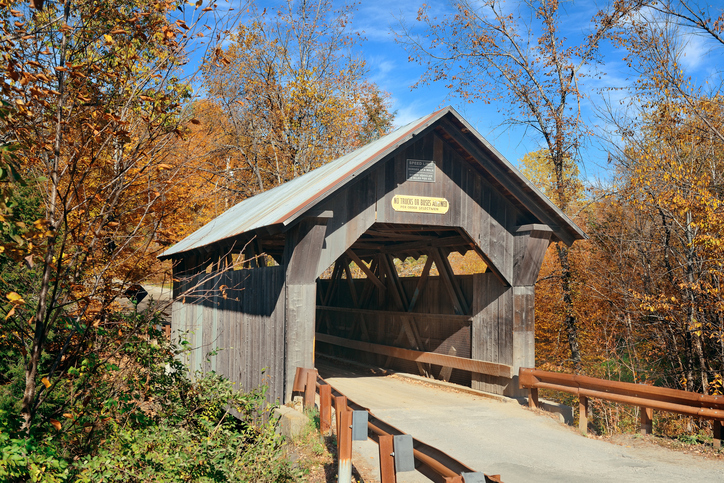 The number one thing we are most thankful for? It’s a tie between family health and family relationships. There you have it. Some interesting tidbits you can throw out at the Thanksgiving dinner table. In the true spirit of the day, I leave you with this thought, “Feeling gratitude and not expressing it is like wrapping a present and not giving it." Have a safe, healthy and Happy Thanksgiving. Thanksgiving. What a great holiday. Family, friends, feasting, fun and football. What’s not to like? If you want to keep this holiday a safe one for you and your family, there are some things to remember. In anticipation of next week’s festivities, I thought it would be a good time for a few gentle reminders. Traveling? Thanksgiving is one of the busiest travel days of the year; by plane, train or car, millions will travel to spend the holiday with family and friends. When you’re behind the wheel, don’t let the distractions get to you, put away the cell phone, and if you’re starting to get drowsy (especially after the big feast) pull off the road. Name a designated driver if you plan to indulge, make sure everyone is buckled up, be prepared for traffic delays and inclement weather. If you are going to be away from your house, remove tell-tale signs of your absence; mail piling up, no lights on, etc. Make sure your house is not a target for thieves. Let’s talk turkey – literally. Every year firefighters respond to house fires caused by families deep frying the turkey. If you plan on frying the bird this year, do it safely – outside, away from the house and children and pets, and with a grease fire rated fire extinguisher on hand – just in case. Take all the safety precautions necessary to avoid mishaps. Know the do’s and don’ts of fryer operations. That goes for the kitchen too. A fire extinguisher on hand for any emergencies is a good thing. Oh, and how about making sure the smoke alarms are in working order? Check. Read up on food safety rules. A call to the Poison Control Center shouldn’t be part of the day’s festivities. Take extra care with children and pets. Last but certainly not least - don’t stress. Thanksgiving is about sharing time with family, expressing gratitude and enjoying the moment. A less than perfect bird or burnt pumpkin pie doesn’t really matter. Now, go forth and prepare the celebration – SAFELY. 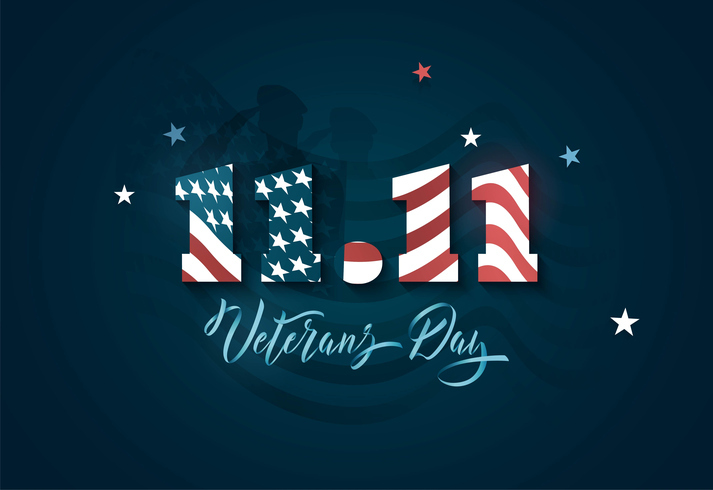 Saturday, November 11 is Veterans Day – a day set aside to honor America’s military veterans for their service, their patriotism and the sacrifices made to protect our nation and preserve our freedoms. This year, recognition has been extended to include and recognize the contributions of military families as well as veterans by designating November as National Veterans and Military Families. There is a very profound reason that the Veterans Day observation falls on November 11. It was on the eleventh hour on the eleventh day of the eleventh month in 1918 that an armistice went into effect stopping the fighting between the allied nations and Germany, ending World War I. At the time World War, I was thought to be “the war to end all wars.” Sadly, that was not the case. Many years and many conflicts later, our military are still making sacrifices to “preserve, protect and defend” the freedoms and opportunities that we cherish and yet sometimes take for granted. In some way, we are all connected to someone in military service; fathers, mothers, siblings, grandparents, co-workers, friends, family, neighbors. Veterans Day is a time to say, “thank you” and show our appreciation for their service and commitment. This week, I’m writing about a topic that I am very passionate about – common sense. 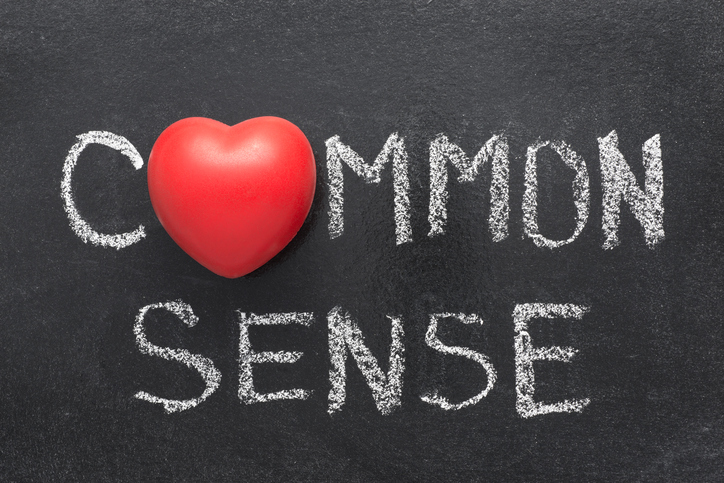 It’s timely since Saturday, November 4 is Common Sense Day. Yep, that’s a fact. There’s a day for it. So how do you celebrate Common Sense Day? Why, use your common sense, of course. Easy, you say? Well, easier for some than others. Just read the headlines each day. What is common sense? It’s defined as a sense of common; the knowledge of simple, sensible things; sound judgment derived from experience rather than study; a process of making good judgments to avoid making mistakes. Like not putting your iPhone in the microwave to recharge it or dry it out or the fact that McDonald’s coffee is very hot or that it’s not a good idea to smoke a cigarette while pumping gas. Who doesn’t know that? Think about it. I used to think that you either had common sense or you didn’t. Now I'm leaning more toward what degree do we use the common sense we have? Maybe we all have it; it just needs to be dusted off and used more frequently. There are ways to improve your common sense. In the interest of brevity, I will cite one. Try taking a little more time to pause and consider your options before acting on impulse. Before deciding that something is a good idea, step back, take a deep breath, think it through and weigh the possible outcomes. For example, is it really such a great idea to stack two chairs on top of each other to reach an item on the top shelf? Just maybe a ladder or a step stool would be a better choice. Take time to think! Then choose the action that is fastest, easiest, has the least chance of “side effects” and gets the best results. That’s using common sense. In the words of Abraham Lincoln, “When you have got an elephant by the hind legs and he is trying to run away, it’s best to let him run.” Well said.